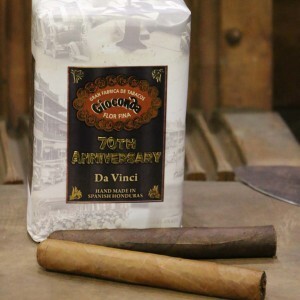 Gioconda 70th Anniversary | Product Categories | Vincent & Tampa Cigar Co. Formerly manufactured in Havana, Cuba by Fernandez, Palicio y Cia. At the turn of the century for export to Italy. Now hand made in Spanish Honduras using the same old-fashioned Cuban tradition. The Italian name Gioconda was taken from the famous “Mona Lisa” painting by Leonardo Da Vinci. Also known in Italy as “La Gioconda” after the presumed name of the mysterious women’s husband. 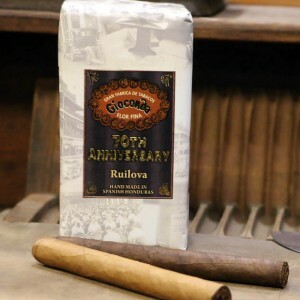 For over 50 years, Vincent Ruilova, one of Tampa’s last great cigar authorities has been creating these vintage premium cigars. Under his supervision only the finest Cuban Seed tobaccos are used in order to insure his original blend is not lost. This century old process of selecting and aging the different types of long filler, binder and wrapper is what gives each Gioconda cigar its unique and consistent flavor. These hand-crafted cigars are medium body and rich in taste. All that can be expected from an extraordinary cigar. These high standards set more than a half century ago have enabled us to continue successfully to create these vintage premium cigars since 1943. Discover for the first time what only a few connoisseurs have experienced. The ultimate in smoking pleasure Gioconda.